File your Pro-rated Form 2290’s before the IRS scheduled maintenance period. E-File your Pro-rated Form 2290’s before the IRS scheduled maintenance period. Hello there Truckers, Now through this article we’re here with a piece of information for you. Every year during the Christmas eve, the IRS plans to shut down their e-file servers due to scheduled maintenance in a motive to basically upgrade their servers where it would allow them servers to process and accept future tax year’s with no hassle (For the Period beginning July 1st, 2018 through June 30th, 2019). During this maintenance period the IRS servers will not be able to process any tax returns up until the IRS officially resumes their operations until the 1st week of January 2018. Hence, we recommend our dear truckers not file tax returns during this period of time as it might place your tax returns on hold which might create unnecessary hindrance despite due time. 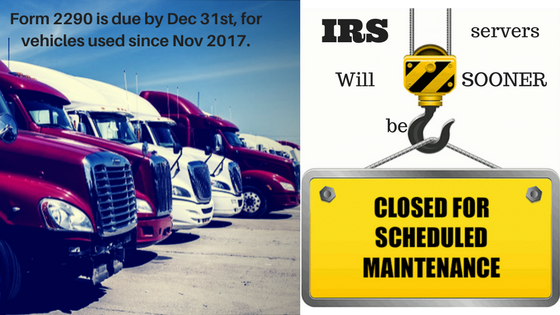 This year we expect the IRS to shut down their severs during the 3rd week of December 2017. Besides we haven’t been informed by the IRS yet. So, we would not encourage our customers to E-File tax returns during this time instead we would ask them to File it way earlier than the scheduled maintenance time to receive an instant acknowledgement back from the Internal Revenue Service. As per the IRS rules, Form 2290 must be filed on a vehicle by the last day of the month following the month of its first use. On that basis, Form 2290 is now due on vehicle which are into service since Nov 2017. Else, Form 2290 is generally an annual tax which is due by June and its payable until the end of August. So, if you had already filed your Form 2290 back in July of this year that will cover you until the end of June 2018 so this deadline alert might not shock you. This entry was posted in 2290 e-file, American Trucking, Form 2290, HVUT 2017 -2018, Truck Tax Online and tagged 2290 e file, Agriculture Vehicle, American Trucking, can form 2290 be efiled, can you e-file form 2290, did irs shut down today, e file form 2290 irs, e file heavy highway vehicle use tax return, e-file for form 2290 excise tax filers, e-file-Form-2290, e-filing your form 2290, ein, federal heavy highway vehicle use tax, Form 2290, Form 2290 Amendment, form 2290 application, form 2290 category w, form 2290 contact number, form 2290 download, form 2290 due, form 2290 e file providers, form 2290 exemption, form 2290 explained, form 2290 extension, form 2290 federal excise tax, form 2290 filing date, form 2290 heavy highway vehicle use tax return instructions, form 2290 heavy highway vehicles, form 2290 help, form 2290 highway use tax, form 2290 instructions 2017, form 2290 irs online, form 2290 july 2017, form 2290 late penalty, form 2290 renewal, heavy duty truck tax, heavy goods vehicle tax bands, heavy goods vehicle tax rates, heavy highway motor vehicle use tax, heavy highway vehicle tax, heavy highway vehicle tax 2290, heavy highway vehicle tax form 2290, heavy highway vehicle tax return, heavy highway vehicle tax return form 2290, heavy highway vehicle use tax, heavy highway vehicle use tax contact, heavy highway vehicle use tax deductible, heavy highway vehicle use tax due date, heavy highway vehicle use tax e file, heavy highway vehicle use tax efile, heavy highway vehicle use tax exemption, heavy highway vehicle use tax form, heavy highway vehicle use tax information, heavy highway vehicle use tax instructions, heavy highway vehicle use tax mailing address, heavy highway vehicle use tax online, heavy highway vehicle use tax phone number, heavy highway vehicle use tax refund, heavy highway vehicle use tax return, heavy highway vehicle use tax return address, heavy highway vehicle use tax return due date, heavy highway vehicle use tax return form 2290, heavy highway vehicle use tax return instructions, heavy highway vehicle use tax return online, heavy truck excise tax, heavy truck fuel tax, heavy truck highway tax, heavy truck highway use tax, heavy truck road tax, heavy truck road use tax, Heavy Truck Tax, HEAVY TRUCK TAX 2290, heavy truck tax deduction 2017, heavy truck tax form, heavy truck tax irs, heavy truck tax write off heavy vehicle use tax online filing, heavy truck use tax, heavy vehicle excise tax, heavy vehicle fuel tax credit, heavy vehicle road tax, Heavy vehicle tax, heavy vehicle tax 2290, heavy vehicle tax break, heavy vehicle tax clearance hawaii, heavy vehicle tax credit, heavy vehicle tax credit 2017, heavy vehicle tax deduction 2017, heavy vehicle tax form 2290, heavy vehicle tax payment, Heavy Vehicle Use Tax, heavy vehicle use tax cost, heavy vehicle use tax due date, heavy vehicle use tax exemption, heavy vehicle use tax exemption form, heavy vehicle use tax fees, heavy vehicle use tax filing, heavy vehicle use tax form, heavy vehicle use tax instructions, heavy vehicle use tax online, heavy vehicle use tax questions, heavy vehicle use tax refund, heavy vehicle use tax return, heavy vehicle use tax return form 2290, heavy vehicle weight tax, how do i e file form 2290, how to e file form 2290, HVUT, hvut 2017, HVUT 2017 -2018, hvut 2290, hvut 2290 due date, hvut amount, hvut cost, hvut due date, hvut filing, hvut form 2290, hvut form 2290 instructions, hvut form 2290 online, hvut instructions, hvut tax, IRS, irs closed government shutdown, irs computer shutdown, irs e file shutdown, irs e file shutdown update, irs electronic filing shutdown, irs federal shutdown, irs filing shutdown, irs form 2290 contact number, irs form 2290 due date, irs form 2290 e file, irs form 2290 heavy highway vehicle use tax, irs form 2290 heavy highway vehicle use tax return, irs form 2290 instructions 2017, irs form 2290 mailing address, irs form 2290 online, irs form 2290 payment, irs form 2290 pdf, irs form 2290 questions, irs gov shutdown, irs government shutdown, irs heavy highway vehicle use tax, irs heavy vehicle tax form, irs mef shutdown, irs shut down efile, irs shut down electronic filing, irs shut down news, irs shutdown fixed, irs shutdown how long, irs shutdown update, irs tax shutdown, irs taxes government shutdown, IRS watermark, is form 2290 filed annually, is irs shutdown, is the irs shut down right now, is the irs shutdown over, Late 2290, Late HVUT fees, Late HVUT payment, Owner Operators, pay heavy highway vehicle use tax online, pay heavy highway vehicle use tax return online, pay heavy vehicle tax online, semi truck tax deductions, semi truck tax depreciation, Truck Licensing, Truck Tags, truck tax online, Truck Tax Online 2290 e file, Truckers, Vehicle Identification Number, VIN Correction, what is a form 2290, what is heavy highway vehicle use tax, what is the heavy highway vehicle use tax, when is a 2290 form due, when is heavy highway vehicle use tax due, where to pay heavy highway vehicle use tax on December 12, 2017 by Truck Dues.